Though the combination of tequila and triple sec is most commonly found in the tartness of a margarita, this alcoholic pairing has many bartending uses. Offsetting the sharp bite of tequila, the smooth tang of triple sec bridges the hard liquor with the other ingredients of the cocktail, making a drink more palatable for those sensitive to tequila's sting and sweeter for those who enjoy fruity drinks. 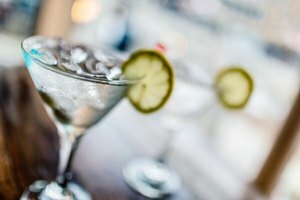 Here are a few common cocktails that are quite simply made offering the duo of triple sec and tequila. The perfect margarita recipe calls for a cocktail on ice, rather than blended like a daiquiri. To make a perfect margarita, you will need Jose Cuervo 1800 tequila, Jose Cuervo white tequila, Rose's lime juice, Bols triple sec, Bols Orange Curacao liqueur and a lime. Begin by adding crushed ice to a shaker and pouring in 2 oz. of Jose Cuervo 1800 tequila (Hint: 1 shot is 1 oz. ), 1/2 oz. of Jose Cuervo white tequila, 1 1/4 oz. Rose's lime juice, 1/2 oz. Bols triple sec and a splash of Bols Orange Curacao liqueur. Wet and rim the outside of a margarita glass with salt and add crushed ice. Strain the cocktail into the glass, garnish with a slice or wedge of lime and serve. The Tequila Mockingbird is a clever little drink that offers the pairing of tequila and triple sec with the sweetness of cherry and the tang of lemon. To make a tequila mockingbird, you will need tequila, triple sec, orange juice, cranberry juice, blue curacao (liqueur), maraschino cherries and a lemon. To begin, fill a tall glass with ice. Pour in 1 1/2 oz. of tequila and 1/2 oz. of triple sec, allowing the liquor to settle to the bottom. Slowly add 2 oz. of orange juice, and then 2 oz. of cranberry juice. Ring the top of the cocktail with blue curacao, careful not to mix or stir the drink. Add a maraschino cherry, garnish with a lemon wedge or wheel and serve. This popular drink mixes a number of liquors and provides quite a kick for such a sweet cocktail. To make a Long Island Iced Tea, you will need vodka, gin, light rum, tequila, triple sec, cola and a lemon. Add a handful of ice to a shaker and pour in 1/2 oz. of vodka, 1/2 oz. of gin, 1/2 oz. of light rum, 1/2 oz. of tequila, 1/2 oz. of triple sec and 1 teaspoon of lemon juice. Fill a Collins glass with ice and shake cocktail mixture. Strain the cocktail into the Collins glass, top with cola, garnish with a lemon wedge or wheel, and serve. This fruity take on the classic Long Island Iced Tea adds the rich flavor of coconut rum and the tartness of sour mix. To make a Barstow, you will need sour mix, Absolut vodka, Jose Cuervo Gold tequila, Malibu rum, Tanqueray gin, triple sec, a lime and cola. To begin, add a handful of ice to a shaker and pour in 1 oz. sour mix,1/2 oz. of vodka, 1/2 oz. of gold tequila, 1/2 oz. of Malibu rum, 1/2 oz. of gin and 1/2 oz. of triple sec. Shake mixture and strain into a high ball glass full of ice. Top with cola until full and garnish with a twist of lime before serving.